Dell Streak 7 is a 7-inch Tablet PC alternative to 5 inch tablet who need bigger screen. This Tablet by Dell will be competing with Samsung Galaxy tab which is already in market & upcoming version of 7 inch iPad. 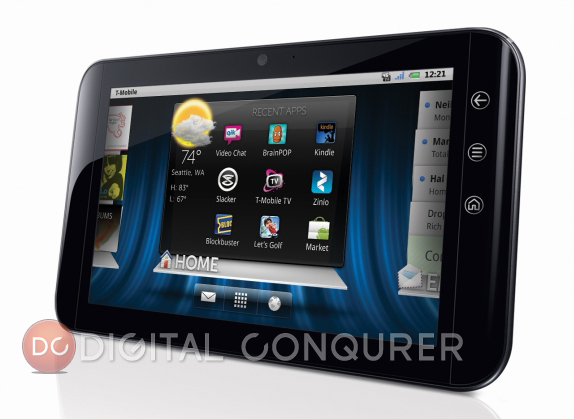 Dell Streak 7 features Gorilla Glass touchscreen Android tablet PC which is going to be available on available on T-Mobile network. The most discussed feature of new Dell Streak is its Gorilla Display. Sure peoploe would like to compare & test it with Apple’s Retina Display & Super AMOLED touchscreen. This tablet runs on NVIDIA Tegra T20- Dual Core which is a 1GHz powerful processor. For very faster Internet experience, it will be compatible with T-Mobile’s HSPA+ network capable of providing 21Mbps Internet browsing speed. So this is how the Dell is giving its best in 7 inch tablet PC segment. After its available in market we will come up with full review. For more of such updates related to Tablet PCs, Android devices, Apps & News Subscribe to us by Email.